Mike Ault, Don Burleson and John Garmany are recognized among best-selling Oracle Authors in the world with over 50 Oracle books. For the first time ever, Burleson, Ault and Garmany combine their talents in this exceptional Oracle11g poster. This poster focuses on the most important DBA views to the underlying tables in the Oracle 11g data dictionary. 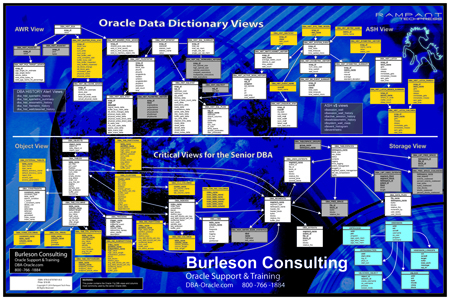 This annotated Oracle data dictionary poster only displays the most important DBA dictionary views, the important data columns and the relationships between the DBA views. It's a great cheat-sheet for writing customized Oracle dictionary scripts. Especially useful are the Automated Workload Repository (AWR) and Active Session History (ASH) DBA views. The most useful feature of this Oracle dictionary reference is the inclusion of the relationships between the views. This allows the Oracle DBA to quickly see the table join keys required for writing complex data dictionary queries. WARNING - This poster is not suitable for beginners. It is designed for senior Oracle DBAs and required knowledge of Oracle data dictionary internal structures. This poster is indispensable for every senior Oracle professional who requires an intelligent quick-reference Oracle poster for the 11g data dictionary. Mike Ault Mike Ault has five Oracle Masters Certificates. Ault was the first popular Oracle author with his book "Oracle7 Administration and Management" and he also wrote several of the "Exam Cram" books. 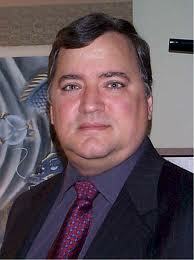 John Garmany has been working as an Oracle DBA since 2002. Blue – Drill down or detail views for expanded data for the White level views.